Who benefits from the "war on terror"? 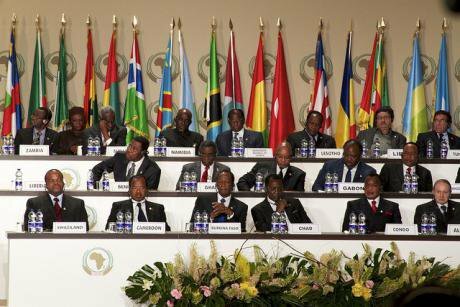 African Union summit. Flickr/Embassy of Equatorial Guinea. Some rights reserved.Global freedom is declining, at least according to the Washington-based NGO Freedom House, and two key issues are contributing to this trend: the rise of violent acts by terrorism groups and increasingly aggressive counter-measures by governments. Around the world, governmental abuse in the name of the 'war on terror' is being witnessed, from the Patriot Act in the United States to Russia’s wars in the Caucasus. 'Terrorism', however, does not originate in a vacuum and reducing it to simple ideological zeal overshadows the fact that terrorist groups feed on pre-existing domestic realities that affect the average citizen, such as unemployment, poor social services, and alienation from political processes. In Africa, the combination of ineffective government, domestic inequalities, and outright oppression contributes to and facilitates the grounds in which terrorism flourishes. The rise of brutal groups such as Al-Shabaab and Boko Haram has been a major setback for many budding democracies, as rulers have increasingly put aside the rule of law and human rights in the name of upholding 'security'. As African governments 'fight terror', democratic institutions are weakened, elections and constitutions become empty shells and the state becomes increasingly brutal towards the citizens it is meant to serve. Africa is home to the world’s youngest population, yet many African heads of state are over 70 years old. The new African Union Chairman, Robert Mugabe, is turning 91 this year and has been at the helm of Zimbabwe for 35 years, meaning that most Africans have only known one Zimbabwean president. Africa’s rapid economic growth in the last decade combined with a young population has led many analysts to believe that the continent has finally reached a turning point. But when it comes to politics, African 'strongmen' continue to tighten their grip on power, even if their justifications to remain in office have changed. Covert operations, extra-judicial killings, military abuses, arbitrary detentions, political persecution, and curtailment of freedom of expression were prevalent in Africa before 9/11, but now they have earned the honourable label of 'counterterrorism tactics'. Today, leaders use a narrative that insists on the need for a strong hand to shield a defenceless population from terrorist bedlam, essentially capitalising on violence in order to remain in office. Many African strongmen have been using counterterrorism to re-legitimise their regimes internationally. Chad and Cameroon are now leading the charge against a resurgent Boko Haram. Their leaders have been in office for 25 and 33 years respectively, and have a long list of human rights violations juxtaposed with a low success rate in developing their countries. For example, Cameroonian President Paul Biya seems to be regaining international acceptance thanks to his efforts against the Nigerian terror group. However, the Cameroonian regime consistently violates human rights in the name of the fight against terror, arresting reporters and civil society leaders who are openly critical of the government. Meanwhile, for other African leaders terrorism has become a lucrative business opportunity. Djibouti’s Ismail Omar Guelleh has capitalised on his country’s strategic location in the war on terror to attract the establishment of foreign military bases and foreign aid. Guelleh, who has been in power since 1999 after being handpicked by his uncle, has gained the favours of western powers that have repeatedly turned a blind eye to his many human rights abuses and increasing autocratic tendencies. Guelleh has even used terrorism charges to push potential political rivals out of the country. According to a Bloomberg report, Djibouti businessman Abdourahman Boreh was accused of involvement in a terrorist attack after he fell out with the president, charges he was cleared of in a subsequent London high court decision. Despite this, though, the U.S. has increased the total financial aid it doles yearly out to Djibouti. Most elections in Africa have been patently undemocratic, turning the continent into a fake-democracy playground for tyrants. Even when elections do take place, incumbent presidents –such as Guelleh and Mugabe- are eager to change the law to be reelected and justify their permanence in office for stability’s sake. Evidently, the 'security for democracy trade-off' is becoming more attractive for African leaders. In fact, the checks and balances of democracy are often perceived as obstacles to getting things done quickly. This trade-off between security and democracy was set to undergo its biggest test as Africa’s most populous nation was due to head to the polls on February 14. With the election now postponed by six weeks, Nigeria’s incumbent president Goodluck Jonathan is facing a tight race against former military dictator Muhammadu Buhari, whose 'iron fist' reputation has attracted voters eager for a quick solution for Boko Haram. However, Buhari’s regime in the 1980s was known to be one of the most repressive in Nigeria’s history, characterised by the imprisonment of dissenting artists and journalists. The former dictator is also being investigated by the International Criminal Court for instigating post-election violence in 2011, which led to the deaths of 800 people and tens of thousands displaced from their homes. Should Nigerians elect Buhari, the West African region may very well find itself steeping back to the times of outright military dictatorship. Terrorism is a global threat that must be part of all countries’ security agendas. But heavy-handed tactics only succeed in the short run, especially in countries where institutions and the rule of law are too fragile to hold their leaders to account. Repressive regimes might provide security and order, but in many African countries they come at the price of democracy, and do not guarantee an increase in the quality of life for the average citizen. Moreover these approaches never truly target the underlying roots of terrorism. The long-term impact of promoting security over democracy is not worth the trade-off.